All transactions are safe and secure with a reliable history in online purchasing behind each of our associates. 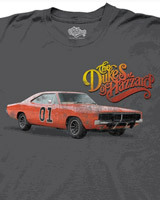 Buy the Dukes of Hazzard General Lee Logo t-shirt to own Dukes of Hazzard clothing and merchandise. After learning how to push the General Lee to its limits at the Hazzard County Driving School, the Duke boys put their driving skills to the test in each episode. The fronts of these Dukes of Hazzard t-shirts display an image of their car next to the TV show logo. When their 1969 Dodge Charger (the General Lee) is damaged they take it to Cooter Davenport's garage for repairs. Cooter will be more than happy to have a look. Wear this tee so that everyone knows that like Bo and Luke Duke, you are also a good ol' boy. Match it with a Dukes of Hazzard hat. In addition to the Dukes of Hazzard General Lee Logo tee above, browse the Dukes of Hazzard Clothing Gallery for more apparel like men's and women's clothes, kids shirts or hoodies.